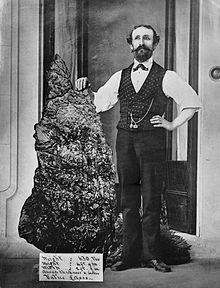 On 14 April 1870, Tom Saunders discovered almost 15 ounces of gold at a place called Red Hill, which is very close to the heart of the now known township of Gulgong, some 400-500 m away from the existing Post Office. Within a very short period of time people heard of this gold and rushed to the town, exploding the population to over 20,000 people. Many were willing to try their luck and gambled their life savings on getting there and investing in machinery to mine the gold. The gold at Gulgong was relatively close to the surface and could be mined by using hand tools rather than the heavy machinery that was needed for the the gold that was usually found in reefs well below the surface. The gold that they mined at Red Hill scattered into lots of different leads that provided the prospector with a daunting task as these leads had many twists and turns and the depth where the gold deposits lay changed directions and provided the miners with an extremely difficult job. Gold discovery in huge quantities was rare; however, over 15,000 kg of alluvial gold was mined in the Gulgong area during this extremely busy period of history. As these would-be miners arrived at the goldfields to seek their supposed easy fortune, most were only to discover that mining was incredibly hard work with extremely harsh conditions that were primitive and success was only enjoyed by a very small minority of miners. The population of Gulgong spread over a large area where people established small claims and built or lived in tents. Some built small huts out of pretty much anything they could find. They used bark and poles. Some built their shelter from hessian and canvas, some others even used newspaper. Many of the miners brought their wives and small children and one can only imagine just how extremely tough it was trying to raise a family in such primitive and extreme conditions. As the mining population grew so did the need for services also grow and people established businesses such as bakeries, butcher shops, barber shops and hardware shops, where the miners could replenish or purchase tools for mining. Blacksmith shops flourished as the need for repairs for all sorts of tools and transport also grew. Hotels sprung up in all sorts of places as the thirst of the miners increased. Over 50 licensed premises were recorded in the area during the peak of the gold rush. Also there were many boarding houses established in Gulgong and around the various new strikes that were discovered. As the miners pushed out to different areas, different leads were discovered and named. Many streets and areas are still known by these names today. Names such as Canadian Lead, Black Lead and Star Lead can still be seen in Gulgong today. Gold was discovered at Home Rule in 1872. As these small leads and claims were established, commercial enterprise sprung up all around them. There is very little evidence today of the hive of activity that existed in the area; however, the Pioneer Museum at Gulgong is a place where history has been preserved and one can get a feel of just how life may have been during the gold rush. A visit to the area should include a visit to this wonderful collection of local history which includes gold mining. It is considered one of the better museums of gold mining memorabilia in Australia. 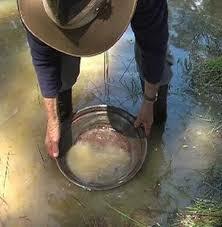 The gold rush certainly was a busy period in the Gulgong area; however, it did not last very long. Within a very short few years most of the leads had been exhausted and by the early 1880’s the gold rush was considered over. Gulgong reduced its population quickly as miners headed off in search of other goldfields. Some remained and established a way of life in the area, such as by farming and grazing. Today Gulgong is surrounded by a variety of different types of farms. A variety of produce can be now found growing in the Gulgong area successfully. Cherries, grapes wine, cattle and sheep grazing as well as small acreage lifestyle-type farms have scattered themselves right throughout the area. The residents of Gulgong are very proud of this important part of their history and the town now boasts a population close to 2000. The township still retains its small street feel that would be a remnant of the gold rush era.